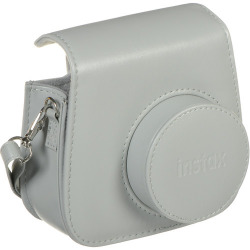 Store and protect your instax mini 9 in the Smokey White Groovy Case from Fujifilm. This poly-synthetic leather case holds your camera vertically with the lens fitting in a custom-made groove. A detachable shoulder strap allows you to remove it and store within a larger bag or carry your case independently.